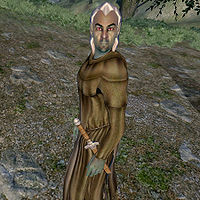 Ilvel Romayn is a Dunmer mage that is found at the Daedric Shrine of Peryite. When you first explore the Shrine you will discover that you can not interact with any of the worshippers as they are frozen in place until you complete Peryite's Quest. Like the other worshippers, Ilvel participated in a ritual meant to summon Peryite; the ritual backfired and their souls were trapped in Oblivion, with only their human bodies left in Nirn. Peryite requests that you travel to his Realm to save them. In the Realm, you will find him due west from your arrival point. You can free his soul by interacting with him. When you return, he will just pick up his old routines and will refuse to talk to you, claiming that he and his fellow cultist must redeem themselves to Peryite. He will then spend all of his time wandering around the shrine, at times sitting on one of the benches, listening to the sermons randomly held by either Kewan or Maren the Seal. Ilvel Romayn wears a set of monks robe and carries an iron dagger. He also carries a few coins. Being a mage, he knows the standard leveled spells for his class. The RefID for his soul (i.e., the part of him that is trapped in Peryite's Realm) is 000E7A90.